Why do we bother with daylight savings time? And... why do we call it "daylight savings" anyway? 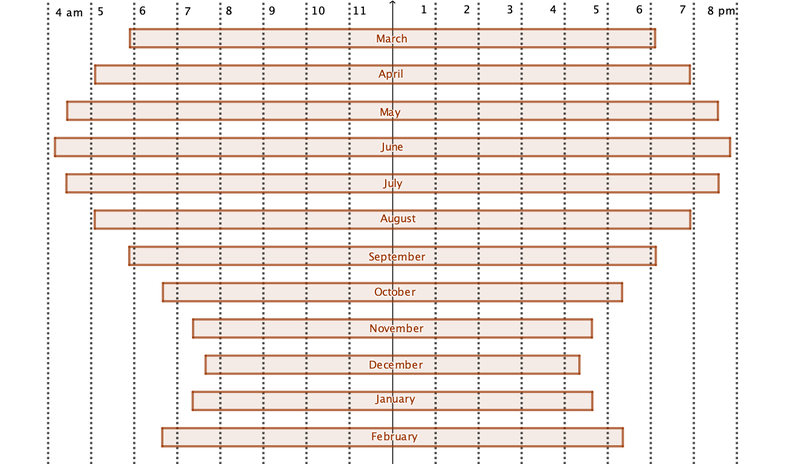 There's a simple answer that becomes apparent when one looks at a graph of available daylight throughout the year. The solid line in the center is both solar and clock noon. As you can see, this is going to work out fairly well in the late fall and winter months. Sunrise in October is just a bit before 7 am and sunset is after 5 pm. Dark December has a sunrise just before 8 am and a sunset just after 4 pm--at least young children can go to and return from school before it is dark. Given that there's so little daylight, it's hard to imagine how we'd want to split things up differently in winter. What should we do with December? Have sunrise at 9 am so we can have sunset after 5 pm? This seems absurd. Have sunrise at 7 am and then have sunset at 3 pm? Even more ridiculous. Solar noon = clock noon seems like the best solution. The solar noon = clock noon is called STANDARD time, and it is what we do in the winter in the U.S. On December 21st, the sunrise was at 7:49 am, the sunset was at 4:30 pm, which means solar noon was at 12:10 pm. 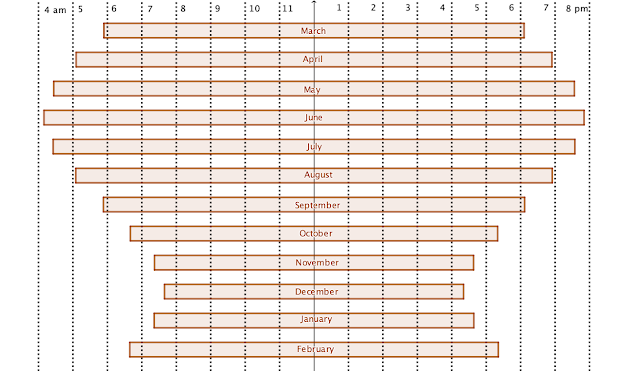 Easy peasy, so why not keep STANDARD time all year? Look again at the chart above, specifically at June. Does it make sense to have the sunrise at nearly 4 am? Are many people going to enjoy the extra hours of sunlight then? Probably not many. It makes more sense to move the clocks forward one hour so 4 am sunrise on June 21st becomes instead a 5 am sunrise--but that also shifts sunset from 8 pm to 9 pm, an extra hour of sunlight in the evening when people are awake and can enjoy it. This is called daylight SAVINGS time because we're "saving" the time from the morning, when few are awake to enjoy it, and then "spending" the time in the evening, when nearly everyone can benefit from it. In truth, Portland, Oregon is far enough north that we could benefit from two hours of a clock shift--5 am sunrise to 7 am and 8 pm sunset to 10 pm sunset--but the one hour of clock shift is a compromise with more southerly states. Because the day lengths change very little near the equator, it makes no sense for countries located in the tropics to do anything other than standard time. Sunrise will be approximately 6 am, and sunset will be approximately 6 pm, month after month. For lower/mid-latitude countries, a one-hour shift in the summer--so the extra sunlight is "SAVED" for the evening hours--makes some sense. For higher/mid-latitude countries, perhaps two hours or more of a shift makes sense, but beyond perhaps two hours, you've maxed out the benefit. Who cares if daylight goes to 11 pm or midnight? Very few people would want to be awake to enjoy the sunlight. In fact, beyond even a certain high latitude, even shifting clocks an hour is pointless. If you're inside the Arctic or Antarctic Circles, you're going to get 24 hours of sunlight. Why change the clocks at all from standard time? You don't need to "save" morning sunlight for the evening--you're going to get sunlight all evening anyway.